Akileo Kaikilekofe, was born in Vaisei, Futuna, on 10 July, 1934. He took the name of Brother Jean-Michel, when making his religious profession in the Society of Mary, at Nakety, New Caledonia, on 19 March 1965. 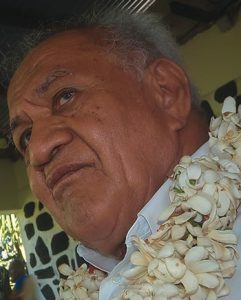 After a time in the School of Montmartre, Vanuatu, he spent a few years in New Caledonia, at the rural craft school in Bourail, and in St Louis, after which he was appointed to Tutu, Fiji, in 1973. Then, in 1975, he went to Greenmeadows, New Zealand, in order to improve his English. In 1977, he was appointed to Wallis, serving in Hihifo and Lano, after which he returned to Montmartre, Vanuatu, from 1979 to 1985. After that he went to Tutu, Fiji, where he spent spent seven years at the Marist Training Centre. In 1992, Brother Jean-Michel was appointed to the Island of Rotuma , where he spent 4 years. After that, he returned to Fiji, to the parish of Wairiki, on the island of Taveuni. 1999 saw Jean-Michel back in Wallis, where he was first at Lano, and then in the new community of Finetomai, when it was established in 2015. He died in the hospital at Sia, Wallis, on 21 October 2017, and he was buried the next day at the cemetery in Lano. He was 83 years of age. May he rest in peace. Information supplied by Père François Jaupitre sm.